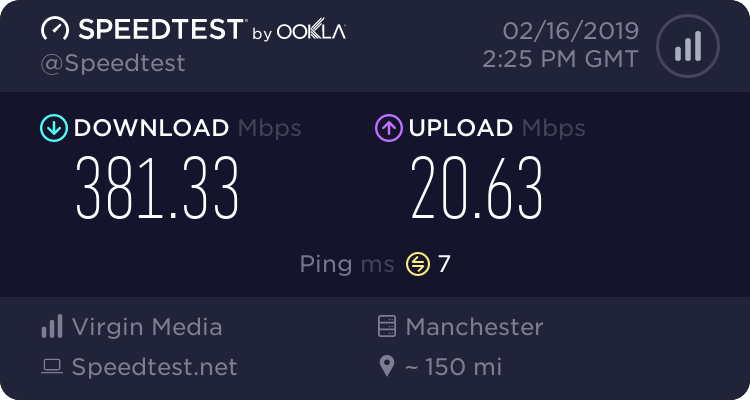 Re: Can Virgin Media increase our upload speed to 8mb/s? I'd actually like to point out that you don't need to upload at the twitch max of 6Mb/s to get a decent stream, ALOT of the big streamers didn't use to stream over 720p because the compression of 1080p at 6mb/s isn't great, you need around 10mb/s for it to start looking really crisp, I would advise you look at lowering the bitrate and increasing the quality settings, or upgrading the streaming hardware to handle higher quality at lower bit rate. I've spent a good chunk of time fiddling with all the settings and playing about with various different quality dials within OBS studio to get mine to a level where I'm pretty happy with the quality. I would advise looking at something like 720p60 @ 3.5Mb/s as that looks respectable and isn't too pixelated, most modern quad cores with hyper threading and clock speed around 3.5Ghz+ will manage the medium quality preset, medium profile, and 32 sample lanczos and look absolutely acceptable - this is using x264. IMO using NVENC on anything above 720p requires more upload than you'll get from Virgin if you want it to have zero pixelation. VM will increase it when you pay them money, that's how the world works. Running on 350Mb VM service with SH3 in Modem Mode, with a ASUS RT-AC5300 router. With this setup I get Fantastic WIRED and WIRELESS Signals in my home. I dont work for VM. But I work in IT, and I know my tech. My advice is at your own risk. I am on the VM350 service and 20Mbps UP is more than enough. Just another VM user trying to help out so my answers may be wrong. You need to look at what's actually going on LAN side- I run AT LEAST 5 gaming devices LAN side and upstream isn't an issue until you get into buffer bloat territory -which is easily resolved with a separate router.